"It is 2021, tomorrow is the 20th anniversary of 9/11. America is under oppression by ultra-liberal extremists who have surrendered governing authority to the United Nations. Hate speech legislation called the "Coulter Laws" have forced vocal conservatives underground. A group of bio-mechanically enhanced conservatives led by Sean Hannity, G. Gordon Liddy, Oliver North, and a young man born on September 11, 2001, set out to thwart Ambassador Usama bin Laden's plans to nuke New York City." Liberality for All is an independent comic book miniseries written by Mike Mackey and illustrated by Donny Lin. Liberality for All explores the possible events in a world where the winner of the United States' 2000 election is Al Gore, leading to the nation being completely controlled by liberal politicians. The result would be an Orwellian United States controlled by a world government United Nations where conservatives are hunted down and Osama Ben Laden plans to nuke New York City with a tactical nuke from Iraq (Iraq became a nuclear state; go figure). 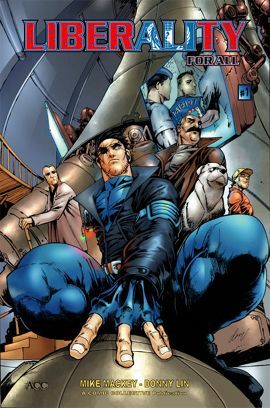 Eight issues were planned; it was canceled after three. Basically one long super-conservative Author Tract which posits the idea that the UN and Democrats want to put terrorists in charge of the United States. And that only a superhero team made up of a Fox News Channel talk show host and two conservative talk-radio hosts/convicted felons — all with Cyborg Artificial Limbs — can save us all. Fun with Acronyms: Freedom Of Information League. Ninja Pirate Zombie Robot: Sean Hannity as an underground conservative resistance leader — with a bionic arm. Real-Person Fic: Sean Hannity as an underground conservative resistance leader.